EtiAmmos/Shutterstock.comMany new biological entities use unique processing flows and steps that can require non-traditional thinking about process validation. Large-molecule drug products and attendant manufacturing processes often involve complex syntheses and purification steps that differ substantially from those employed for small-molecule pharmaceutical products. In fact, it has been said that for biotechnology products, “The product is the process.” Traditional small-molecule drug products have well-defined chemical structures and can be analyzed to ensure conformance to specifications. Biopharmaceuticals are often complex molecules, or mixtures of molecules, produced in biological systems and it is not always possible to fully characterize these products in the laboratory. Therefore, the manufacturing and purification processes become critically important in ensuring the “sameness,” quality, efficacy, and safety of these products. Process validation is documented process understanding and control that begins when it is determined that a cell, molecule, or compound may have clinical significance and ends when the product is no longer viable in the marketplace. Each product and process may have different validation formats and structures and may not fit the traditional validation models. Validation requires careful thought and planning. It is not a stack of protocols and reports designed to satisfy regulatory expectations. It is not following by rote a series of “qualifications” such as design (DQ), installation (IQ), operational (OQ), and performance qualification (PQ) studies. It is not hiring a validation company to develop the protocols, perform the studies, and write the reports. The need for formal process validation became evident following a series of incidents beginning in the early 1960s. Thalidomide, a widely prescribed drug for morning sickness in pregnancy, was determined to have caused birth defects, leading to the 1962 Kefauver-Harris Amendment to the US Federal Food, Drug, and Cosmetic Act, which among other provisions, authorized FDA to issue good manufacturing practice (GMP) regulations for “manufacturing, packaging, or holding of finished pharmaceuticals.” Those regulations were finalized in 1963 as 21 Code of Federal Regulations (CFR) 133 “Drugs; Current Good Manufacturing Practice in Manufacture, Processing, Packing, or Holding” (1). During the period 1966-1972, a series of incidents at Evans Medical Ltd., Liverpool, England, led to the deaths of five people due to microbially contaminated infusion fluids. The contamination was found to be due to problems with the autoclaves used to process terminally sterilized parenterals (2). From 1970-1973, a series of septicemia events in hospitals throughout the United States due to contaminated IV fluids were linked to inadequate container-closure systems and terminal sterilization conditions for large-volume parenterals (LVPs) produced by several manufacturers. Following a series of inspections, FDA questioned the manufacturers’ ability to ensure sterility of these products, leading to the promulgation of GMP regulations for LVPs in 1976 (3). Although the LVP GMP regulations were never finalized and were ultimately withdrawn, they established formalized requirements for the validation and monitoring of critical processes such as sterilization. When the US GMP regulations underwent a major revision in 1978, validation requirements for sterilization processes were included (4). Subsequent revisions to US and international regulations and guidance documents stressed the need for process validation and quality management systems to ensure pharmaceuticals and biopharmaceuticals are safe and effective. In May 1987, FDA issued a draft process validation guidance document for comment (5). That draft guidance was followed by two more, one in 2008 (6) and one in 2011 (7). Each of these guidance documents was intended to clarify FDA’s expectations regarding process validation. The International Council for Harmonization (ICH), an organization composed of regulatory authorities from the US, Europe, Japan, Canada, Switzerland, Brazil, China, and the Republic of Korea, and representatives of pharmaceutical industry organizations, has published a series of documents that, among other things, relate to process validation: Q6B for setting specifications for biotechnological and biological products (8), Q7A for active pharmaceutical ingredients (9), Q8 for pharmaceutical process development (10), Q9 for quality risk management (11), Q10 for pharmaceutical quality systems (12), and Q11 for drug substance development and manufacture (13). In 2007, ASTM International published E2500, Standard Guide for Specification, Design, and Verification of Pharmaceutical and Biopharmaceutical Manufacturing Systems and Equipment, which describes an alternative to conventional process validation (14). Process has been defined in a number of ways. One dictionary definition is “a particular method of doing something, generally involving a number of steps or operations” (15). Another definition is “a series of actions that you take to achieve a result” (16). However, these definitions do not adequately consider the factors influencing the operations, actions, and steps that constitute a process. Those factors include the processing system itself, the inputs that drive the system, and the system outputs. Scherkenbach, a student of W. Edwards Deming, defines process broadly yet concisely. “In its simplest form, a process is a blending or a transformation of inputs such as people, materials, equipment, methods, and environment into outcomes. Some of these inputs do the transforming and some of them are transformed” (17). This definition considers important process influences lacking in dictionary definitions. The keys to the effectiveness of this definition are the identified influences on the inputs and outputs. Those influences must be defined, evaluated, and controlled to ensure the process performs as intended. Figure 1, based on Scherkenbach’s work, presents a process definition applicable to pharmaceutical and biopharmaceutical validation. Specifically, a process is inputs operating through a processing system to produce outputs. The inputs and outputs are influenced by people, material, equipment, procedures, and the environment in which they operate. Processes may be discrete or linked so that the output of one process becomes the input to another, or multiple process outputs may serve as inputs to another. For example, a drug substance is an input to a process that produces a drug product, along with other components that result from other processes. And the drug substance itself is likely the result of multiple process inputs and outputs. Validation of pharmaceutical processes was codified in the mid-1970s. That does not mean that earlier pharmaceutical processes were not validated. Pharmaceutical manufacturers had quality control programs that ensured the robustness of their manufacturing processes and the quality of the pharmaceuticals they produced. However, the scope of those programs depended on individual manufacturers resulting in variable effectiveness. Codification of validation expectations and requirements was intended to reduce that variability. The 1978 CGMP regulations (4) discussed validation in terms of automatic, mechanical, and electronic equipment (21 CFR § 211.68), validation of supplier’s test results for components, drug product containers, and closures (21 CFR § 211.84(d)(2)), and validation of any sterilization process (21 CFR § 211.113). However, the word validation was not explicitly defined. FDA’s 1987 process validation guideline defined validation as “Establishing documented evidence which provides a high degree of assurance that a specific process will consistently produce a product meeting its pre-determined specifications and quality attributes” (5). In 2000, ICH Q7A defined validation as, “A documented program that provides a high degree of assurance that a specific process, method, or system will consistently produce a result meeting pre-determined acceptance criteria” (9). The concepts presented in the definitions of validation and process can be combined to form a meaningful definition of process validation applicable to the production of pharmaceuticals and biopharmaceuticals. FDA’s 2008 draft process validation guidance document defined process validation as “the collection and evaluation of data, from the process design stage throughout production, which establishes scientific evidence that a process is capable of consistently delivering quality products” (6). The 2008 definition falls short in several areas, not the least of which is that the process is capable of delivering quality products instead of that it does deliver quality products—and does so consistently and reproducibly. Also, the term “quality products” is nebulous. Does quality relate to meeting regulatory requirements? Or, does it relate to product safety and efficacy? ICH Q8(R2) provides an excellent description of process validation vis-à-vis product development (10). 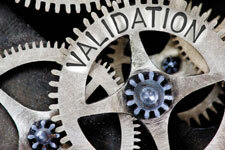 Process validation, based on the combination of the definitions of the words process and validation, is establishing, documenting and verifying that the inputs, operating through the processing system, result in outputs that consistently meet pre-determined acceptance criteria and quality attributes. This definition is remarkably similar to FDA’s original 1987 definition of validation. In essence, process validation is documented process understanding. Validation is necessary throughout a product’s lifecycle, from initial development through commercialization, to ensure it is safe and effective. The molecule originally identified as possibly having clinical significance must be fully characterized and its synthesis routes developed with the aim of scalability. Formulations to be used in clinical trials must be developed. The clinical formulations must be scalable to commercial production, retaining their effectiveness and safety attributes. Commercial production processes must be robust and reliable to ensure consistent product quality, maximize efficiency, and minimize cost. Process validation should—read must—begin at the very beginning to ensure the finished product can be manufactured and controlled to provide requisite levels of clinical effectiveness and patient safety. Products manufactured with validated processes almost invariably meet all regulatory expectations and quality requirements. Start by thinking about the goals: What is the purpose of the study; what should it show, or prove, or demonstrate? Successful validation efforts often follow the 80-20 rule—80% of the effort should be thinking, evaluating options, and planning, and 20% should be devoted to performing the study. This optimizes the chances of success. Often, however, the reverse percentages are employed, resulting in wasted resources and yielding validation reports that do little to support the effectiveness of the processes they were intended to validate. A process consists of inputs operating through a processing system resulting in outputs. The inputs, outputs, and the processing system, are influenced by people, materials, equipment, procedures, and the environment in which the process operates. All of these things must be considered and evaluated before developing the validation strategy and writing the validation protocol. Each process is unique, and no validation approach is universally applicable. Validation of a purification process for monoclonal antibodies differs substantially from validation of a steam-sterilization process for a drug product in its final container. Terminal sterilization does not work as a model for validation of a pharmaceutical water system. Commercial production processes must be robust and reliable to ensure consistent product quality, maximize efficiency, and minimize cost. • Define the inputs, the processing system, and the expected outputs. • Don’t get bogged down in terminology. • Define critical and non-critical process attributes and parameters. • Demonstrate a state of control. The second part of this three-part series will provide a generalized example intended to show how a validation plan might be developed to support a process unrelated to biopharmaceutical manufacture, but which demonstrates various points to consider related to the inputs, the processing system, and the outputs that can be applied to biopharmaceutical processes and systems. Part three will cover validation of a non-traditional biopharmaceutical process, and lifecycle and change management. 1. FDA, Drugs; Current Good Manufacturing Practice in Manufacture, Processing, Packing, or Holding. In 21 CFR 133, 28 Federal Register 6385, 1963. 2. B. R. Matthews, PDA J. Pharm. Sci. Technol. 56 (3), 137-149 (2002). 3. FDA, Current Good Manufacturing Practice in the Manufacture, Processing, Packing, or Holding of Large Volume Parenterals for Human Use. In 21 CFR 212, 41 Federal Register 22208, 1976. 4. FDA, Current Good Manufacturing Practice for Finished Pharmaceuticals, In 21 CFR 211, 43 Federal Register 45077, 1978. 5. FDA, Guideline on General Principles of Process Validation (CDER, Rockville, Maryland, 1987). 6. FDA, Guidance for Industry, Process Validation: General Principles and Practices Draft Guidance (CDER, Rockville, Maryland, 2008). 7. FDA, Guidance for Industry, Process Validation: General Principles and Practices (CDER, Rockville, Maryland, 2011). 9. ICH, Q7 Good Manufacturing Practice Guide for Active Pharmaceutical Ingredients (ICH, Geneva, Switzerland, 2000). 10. ICH, Q8(R2) Pharmaceutical Development Revision 2 (Step 4 version)(ICH, Geneva, Switzerland, 2009). 11. ICH, Q9 Quality Risk Management (Step 4 version) (ICH, Geneva, Switzerland, 2005). 12. ICH, Q10 Pharmaceutical Quality System (Step 4 version) (ICH, Geneva, Switzerland, 2008). 13. ICH, Q11 Development and Manufacture of Drug Substances (Chemical Entities and Biotechnological/Biological Entities) (Step 4 version) (ICH, Geneva, Switzerland, 2012). 14. ASTM, E 2500, Standard Guide for Specification, Design, and Verification of Pharmaceutical and Biopharmaceutical Manufacturing Systems and Equipment(ASTM International: West Conshohocken, PA, 2007). 15. M. Agnes and D.B. Guralnik, Eds., Webster’s New World College Dictionary, Fourth Edition ed. (Wiley Publishing, Inc., Cleveland, Ohio, 2007). 16. Cambridge Dictionary, https://dictionary.cambridge.org/dictionary/english/process (accessed March 10, 2018). 17. W. W. Scherkenbach, The Deming Route to Quality and Productivity Road Maps and Roadblocks, p. 145 (CEEPress Books, George Washington University: Washington, D.C., 1986).